The 2019 Nissan Versa looks like it hopped right out of 2008, which usually isn’t a good thing. But the 2020 model will finally put the Great Recession behind it, with a new look that brings it ever so closer to modern times. It’s also keeping the option for a manual transmission in the U.S., unlike other sedans we know. 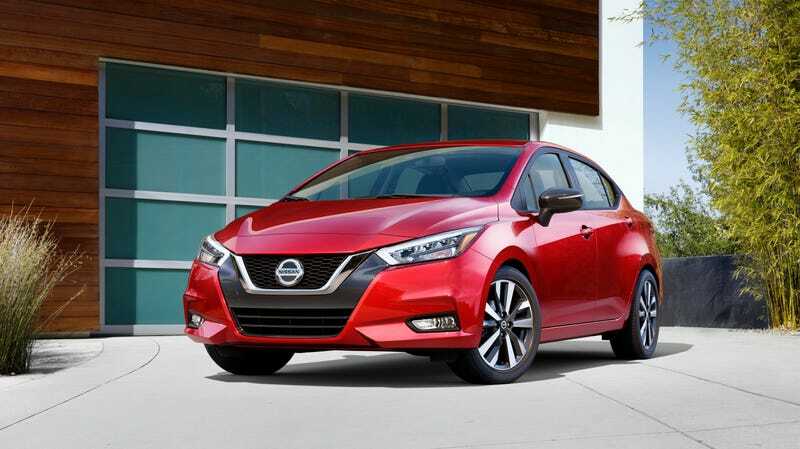 Nissan announced the 2020 Versa on Friday, saying it goes on sale this summer with a 1.6-liter, four-cylinder engine rated at 122 horsepower and 114 lb-ft of torque. That’s somehow up from the 2019 model, which makes a rated 109 HP and 107 lb-ft of torque across the trim lineup. The only Versa Nissan announced on Friday was the compact sedan, since the Versa Note hatchback is dead for 2020. We hardly knew it. The 2019 Nissan Versa sedan (left) and 2020 Versa sedan (right). The 2020 car will have the same transmission options as the last, which include a five-speed manual or Nissan’s “Xtronic” CVT, as well as some standard tech and safety features: keyless entry, power windows (impressive! ), a push-button start, automatic emergency braking with pedestrian detection, lane-departure warning and high-beam assist. The 2020 Versa will also have eight paint colors, as well as optional add-ons like additional safety features, heated front seats, automatic climate control, Apple CarPlay and Android Auto. But, whatever it costs, the 2020 Versa will look miles—years, actually—better than the last, since it’s finally leaped out of 2008 and closer to modern times. Let’s just hope it doesn’t bring any recessions with it.